The Olympic winter games were played out in the Republic of Korea last month. Inspired by the games, we’ve put together our pick of the best winter Olympics themed online pokies we think Kiwi players will love. Hockey Hero is a title of Push Gaming that focuses on one of the most popular ice sports, hockey. This game’s reels are set against the backdrop of an ice hockey arena complete with invigorating soundtrack and stunning visuals. The pokie boasts 40 paylines and 5 reels and is available at most online casinos. Other than the obvious pucks, the game has a Gold Cup as the wild and a Goal as the scatter. Land 3 or more scatters on your reels and you’ll score some free spins. The pokie has 3 hockey players dressed in different jerseys. Each time the first reel is fully stacked with one of the players (for instance all red jerseys), it triggers the hold and re-spin feature where you will encounter random multipliers to increase your winning chances. Let’s face it, ski jump is a crazy, hairbrained, totally thrilling winter activity. So, courtesy of Genesis Gaming, you can look forward to a number of bonus features, 10 paylines, 3 rows and 5 reels. The slot’s designed to work on Microgaming’s Quickfire platform and the transparent reels will make you feel like you’re balancing at the top of the ski run. All the game’s symbols relate to the theme, and once you pick a national flag, the game starts. Symbols include a helmet, ski boots, a medal, flowers, goggles and even silver trophies. The wild symbol is a badge and the scatter is a cowbell. There are free spins, multipliers and a ski jump feature to look forward to. Finally, Playtech’s ice hockey slot makes it on to our list of incredible winter Olympics themed pokies. This pokie brings players a genuine feeling of the ultimate sports spectacle. Before you even begin playing, you’re required to choose two teams to compete against one another. There are four special symbols which include the net, an ice hockey logo, free games sign and the puck. If you are lucky enough to land two of the symbols of the free game of the same flag on the first and fifth reels, you get 12 free spins. Best of all, all players are from the same team, which increases your chances of winning. 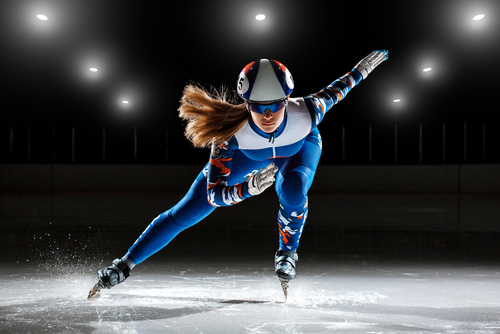 Were you hooked on this year’s winter Olympics? Did you know that this year’s festivities allowed athletes to compete in more than 100 events in 15 different disciplines of sports? Well, pull yourself up out of those post-game blues and log in to your favourite online casino to play the fantastically themed pokies in our list and spin those reels for free spins, major jackpots and tons of fun. After all, we know just how much you love your pokies!